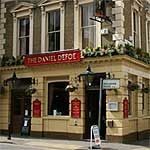 A traditional country pub in the heart of the capital, Daniel Defoe is popular with locals for its top quality food. However, this is no stale gastropub, sticking closely to its roots. Do you work at Daniel Defoe? What did you think of Daniel Defoe? 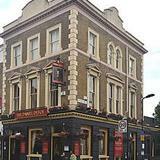 The Daniel Defoe is an authentic British pub which nods to Stoke Newington’s literary heritage and provides an excellent range of beers, which has earned it a well-deserved place in the Good Pub Guide. Occupying a prime spot on Stoke Newington’s trendy Church Street, The Daniel Defoe had a refurbishment last year and remains freshly painted in cream, with a red and gold exterior and red patterned carpet and gleaming woodwork interior. Plant pots and warm lighting add a distinctly homely feel. The fresh-faced building is home to a friendly neighbourhood pub and excellent beer garden with a wooden decked terrace – perfect for the summer months. The Daniel Defoe has always been a little quieter and humbler than the other Church Street pubs, but nevertheless it has carved out a niche for itself as being a reliable place to get a good drink and a table. The aforementioned beer garden makes it a hotspot in the summer, but for the most part, the atmosphere here is much more low key than other local establishments and it takes pride in this. The menu is classic pub grub, done well of course – everything from an 8oz homemade Aberdeen Angus beef burger with toasted focaccia bun, dressed salad and homemade chunky chips to traditional sausage and mash served with gravy (with a special sausage selection of the day) – both £8.95. There are also a number of vegetarian options for the health-conscious Stokie clientele – the portobello mushroom risotto with parsley and cheddar cheese (£7.95) comes recommended. In addition to the main menu, there are also daily specials, a Friday night steak deal and Sunday roasts – it is clear effort has been taken to provide something a cut above the rest. Beer is the focus at The Daniel Defoe; real ale fans can choose from some classics such as Bombardier, Directors Bitter, St Austell Tribute, whilst lager drinks have the choice of Jamaican Red Stripe, Fosters and Erdinger, plus there’s your standard Guinness and also a Stowford Press cider for the apple lovers. Pints are priced between the £3.80-£4.90 mark, whilst wines will set you back £15-£18. There’s also an extensive single malts menu, with over twenty different types, varying from £3- £6, for the whisky drinkers. However, if you’re unsure bar tenders at The Daniel Defoe will happily chat and recommend a tipple. The Daniel Defoe is a bonafide British local, serving good ale and great food, with a proper pub atmosphere and a great garden for the warmer months (no football screens here! ).